It is written the natural man (worldly) does not accept nor understands what is spiritual, for their mind is set on this world and all it offers. To speak Gods word is considered foolishness to them. (1 Corinthians 2:12-16) Now we have received, not the spirit of the world, but the spirit which is of God; that we might know the things that are freely given to us of God. Which things also we speak, not in the words which man’s wisdom teacheth, but which the Holy Ghost teacheth; comparing spiritual things with spiritual. But the natural man receiveth not the things of the Spirit of God: for they are foolishness unto him: neither can he know them, because they are spiritually discerned. But he that is spiritual judgeth all things, yet he himself is judged of no man. For who hath known the mind of the Lord, that he may instruct him? but we have the mind of Christ….. (Proverbs 20:27). Life and death are all in the way we live our life, and to continue in the way of what the flesh (carnal) offers takes us away from all Christ died to give us including eternal life! (Romans 8:5-10). For they that are after the flesh do mind the things of the flesh; but they that are after the Spirit the things of the Spirit. 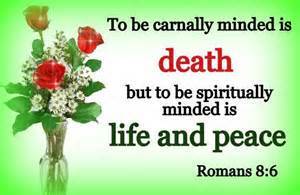 For to be carnally minded is death; but to be spiritually minded is life and peace. Because the carnal mind is enmity against God: for it is not subject to the law of God, neither indeed can be. So then they that are in the flesh cannot please God. But ye are not in the flesh, but in the Spirit, if so be that the Spirit of God dwell in you. Now if any man have not the Spirit of Christ, he is none of his. And if Christ be in you, the body is dead because of sin; but the Spirit is life because of righteousness…. (1 John 2:15-17). The longer one is a Christian the more it becomes clear the power the flesh had over them, and the gained strength the Spirit of truth keeps us in remembrance of the written word and shows us spiritual things the world cannot. (John 16:13-15). Howbeit when he, the Spirit of truth, is come, he will guide you into all truth: for he shall not speak of himself; but whatsoever he shall hear, that shall he speak: and he will shew you things to come. He shall glorify me: for he shall receive of mine, and shall shew it unto you. All things that the Father hath are mine: therefore said I, that he shall take of mine, and shall shew it unto you.